I love Teacher Appreciation Week at my school. The parents make everyone on the staff feel very much appreciated. I also love this week because there is usually a TpT sale so that I can stock up on my wishlisted items for the end of the year! Well, the time is upon us! This week is Teacher Appreciation Week at my school, and guess what?!? The TpT Teacher Appreciation Sale starts today too! When you use the code CELEBRATE at checkout, you can save 28% off of your cart. The sale will run Tuesday and Wednesday, May 3 &4. The Frenzied SLPs decided to share some things that we are excited about offering to you, and also share some things that are on our wishlists! 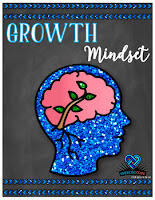 This Growth Mindset product from Speech to the Core looks great! We have been focusing on this at my school along with improving our feedback with students. I'm excited to have some activities and posters to go along with our work! My students have been BEGGING for Cariboo lately! I have a few sets of articulation cards that I have made for my students, but haven't had time to make sets for all of the sounds. 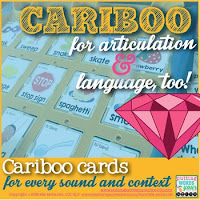 This set of Cariboo for Articulation and Language, Too! from Mia at Putting Words in your Mouth looks like it will work perfectly for me and be such a time saver. This is a product that I have used so much with my students since I created it. Categories! has everything you need to target labeling and sorting items in categories. This has worked great with my preschool, kindergarten, and students with ASD. 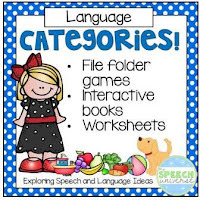 You know I am all about interactive books, and the books in this packet have targeted categories in a new way for me, as they have helped to increase length of utterance when describing categories. I have had so much fun using the activities in this packet. 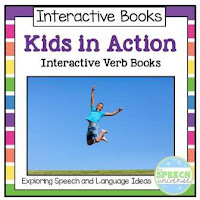 While on the topic of using interactive books, Verb Interactive Books: Kids in Action is another one that I have used so much since I created it. Using real pictures has helped me work on verbs in a new way with my students. Having the visual sentences right under each picture has helped them to increase their sentence structure, length, and use of verbs. This has been great with my students with ASD! Your Language folders look like a perfect summer project, thank you!